In one of the games of the season, the Cats have pulled off a minor miracle with an after the siren, matchwinning goal via Hawkins and they win their ninth consecutive game against the Hawks! GOAL CATSThe Cats on the break: Selwood dashes through the middle and hits Hawkins on the lead. The siren sounds, he drives a long bomb from outside the arc, it sails high and sails true! Cats win! BEHIND HAWKSAfter Rioli ran down Duncan and it should have been holding the ball, the Hawks have registered a behind that hits the post. Blood rule as Mitchell comes off and we have one and a half minutes to go in this ball game. Can the Hawks hang on!? BEIND HAWKSTaylor fumbles the ball over the line and the Hawks take a three-point lead. It most likely won't be a draw now. GOAL CATSHawkins has snapped his fifth goal of the night against the flow of play after a great handball from Smedts and the Cats are back within two points in this incredible contest! BEHIND HAWKSHale shoots at goal but has his shot touched on the last line of defence. BEHIND HAWKSBurgoyne hits the kick out in front of Breust who runs in, fires at goal but bounces it through for a handy behind. GOAL HAWKSFrom the boundary throw-in deep inside the Hawks' attacking 50, the footy is tapped down to Sewell who slams ball on boot and drills the goal that puts the Hawks in front! Unbelievable! Desperation galore in these final minutessix minutes of game time to go. Will we have our first draw of the season!? An incredible game of football deserves an incredible conclusion and that is exactly what we are getting. GOAL HAWKSSmith is shoved out of the contest and wins the free. He swings the centered pass inside 50 to find Whitecross 45 out. A sublime set shot from the paint and he levels the scores! Wow! GOAL HAWKSRoughead chips a sideways pass to Gunston that travels 15.1 metres. Gunston, from on the arc, strikes it wonderfully, it has the carry and it has the distance! One goal the difference! 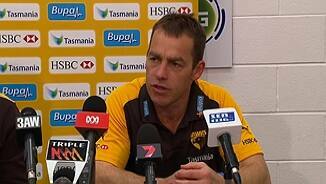 BEHIND HAWKSRioli keeps the ball in play and works it back to Puopolo who collects the footy, snaps but is off line. GOA HAWKSGunston gathers the ball with some clever work, shoots the handball to Rioli in space who snaps the shot at goal over his shoulder and snaps truly! The Hawks will not lie down! GOAL CATSKelly sends the ball forward out of the congestion and Hawkins uses his body to out-muscle Schoenmakers. From 45, Hawkins threads the eye of the needle! His fourth! Cats by 19. GOAL CATSGuerra catches Podsiadly high inside the Cats' attacking 50 as he raises his elbow and a late whistle from the ump as he awards the free. The J Pod delivers. Breathing space. Cats by 13. GOAL HAWKSA chain of handballs releases Suckling who eventually gives it off to Smith, he in turn dishes it out to Puoplo who fires at goal and steers it home! Hawks back within seven points! BEHIND HAWKSPuopolo drives the shot at goal from 45 on the run but Mackie gets back to fist it over. BEHIND CATSSheringham fires at goal under pressure but it is rushed over the line for a behind. GOAL HAWKSRoughead slips the handball inside to Burgoyne who breaks free and drives home the opening goal of the quarter from 35 on the run! He has two and the Hawks trail by just 13 points! Final quarter underway and we have a Friday night thriller on our hands between two great clubs who have a stunning rivalry. Hodge has been subbed out and Savage is on for the Hawks. The siren sounds and at 3QT the Cats are in front by 19 points in a seesawing affair. The game has been building fast and it may just erupt in the final quarter. Don't go anywhere! One minute to go in the third term and the Cats hold a 19point lead. A goal either way makes things very interesting. 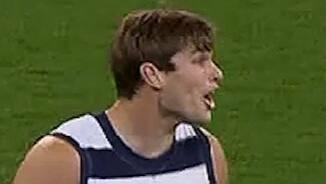 Josh Hunt has been subbed out of the game with a sore left quad and Motlop has been activated for Geelong. BEHIND CATSHawkins held out of the marking contest and the umpire blows the whistle to award the free. From very tight in the left pocket, he swings it at goal but misses. GOAL CATSHunt, 70m out, drives the ball to the danger spot and Hawkins stands strong to clunk the grab 10m out from the sticks. He runs around, snaps and threads it! He has three. Cats by 18. GOAL HAWKSThe Hawks on the fast break: Gunston to Rioli who lobs it inside 50 to find Puopolo 40 out tight in the right pocket. He guides through the goal! Great build-up. Hawks trail by 12. BEHIND CATSDuncan works in to space and drifts in to take the leading grab and can go back to attempt to slot his third major. He is off line to the left. Cats by three goals. GOAL CATSHawkins tries to crumb the ball but is shoved out of the contest, Walker collects under pressure, sells the dummy once, throws the ball on to his boot and dribbles it home! GOAL HAWKSAfter a brilliant tackle, Puopolo drives the ball deep in to the pocket, Hale attempts the mark, the ump blows for a free for a hold, advantage awarded as Gunston waltzes in and goals! GOAL HAWKSTaylor mucks up his defensive kick and the Hawks pounce: Rioli to Lewis and he lowers his eyes and finds Gunston 20m out. Gunston makes no mistake as he slots the goal! 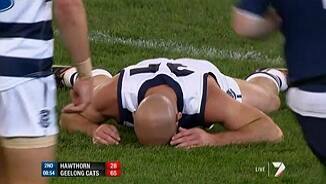 GOAL CATSBartel takes the mark on the 50 and then pops the pass out in front of Chapman who plucks the grab 35 out. He fires from 40 and he nurses home his fourth! Happy Chappy! Cats by 23. 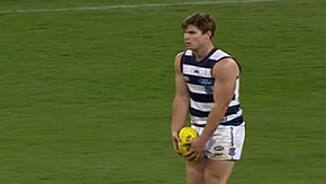 BEHIND CATSThe umpire has awarded a dubious free kick against Birchall to Hawkins for a block maybe? Hawkins misses the set shot, and that is just reward. No way was that a free. BEHIND CATSSmedts is off line to the right as his set shot fades late and the Cats lead by 16 points. GOAL HAWKSThe Hawks answer with a quick reply as Whitecross takes the advantage following a free kick to Guerra, he handballs to Burgoyne who launches a bomb from outside 50 and rides it home! BEHIND HAWKSLewis wobbles a kick inside attacking 50, Rioli, crumbs it beautifully, swings the ball on to his boot and bounces it in to the post. BEHIND HAWKSRoughead inside to Lewis who breaks a tackle, is able to run in but tugs his shot wide under pressure. The third quarter is underway and the key stats; tackles, contested possessions and inside 50's are more or less even. This game is right in the balance. After the Cats registered their highest ever score in a first quarter against the Hawks, the Brown and Gold has stormed back with a fivegoal to one term and trail by just 17 points in a beauty! GOAL HAWKSRioli wins the centre clearance and with a thumping pass deep in to the left forward pocket, he finds Roughead on the lead! With time ticking down, he drop punts it home! Game alive! GOAL HAWKSMitchell pumps a high ball inside attacking 50 in to the left pocket and Rioli from the side leaps to clunk a brilliant overhead grab! Cyril knocks through the Hawks' fourth in a row! If the Hawks can grab a late goal before the half time break it will give them great confidence and they will be firmly in the hunt. BEHIND HAWKSSmith with a flying shot at goal out of the congestion but he misses to the right. BEHIND HAWKSRioli eventually roves the ball inside 50 after paddling it in front of him, he is in two minds, shoots at goal and misses a sitter! Incidental contact from Guerra on Chapman I would assume and Chappy is fine, taking a breather on the bench. This match has lifted in intensity and we have a ball game! GOAL HAWKSIt started with Guerra who charged for the ball on half back and collected Chapman, the Hawks broke quickly, Whitecross marked on the 50, dished it to Gunston who stormed in and goaled! BEHIND CATSSmedts roves the ball off the pack, swings the shot at goal but is off target. BEHIND CATSScarlett with a short jab just the required 15m inside 50 to Johnson who marks on the chest. He starts it right and that is where it will stay. BEHIND HAWKSMitchell takes the intercepting mark on the 50, plays on quickly and finds Hodge 30m out. In game 199, he hooks the shot right. Costly. BEHIND HAWKSSuckling unloads from 55m out and is off line to the right but the Hawks have found some run and momentum and are right in this. GOAL HAWKSHale standing tall judges the high ball inside 50 best and takes the contested grab 35m from the sticks. He steers it through and the Hawks' register consecutive goals for the first time. BEHIND HAWKSAnother rushed behind to the Hawks as Enright fists it through with a great spoil. BEHIND HAWKSLonergan pushes the ball across the behind line for a minor score to the Hawks. GOAL HAWKSBreust is pulled off the ball by Lonergan inside the Hawks' attacking 50. Free kick. Breust, from 45, nails a desperately needed major and reduces the margin back to 45. GOAL CATSHawkins with great strength takes a juggling mark right on the 50m line. He will go back and take the set shot. He strikes it beautifully and he brings up the Cats' 10th goal of the match! We begin the second quarter and the Hawks find themselves 45 points down. 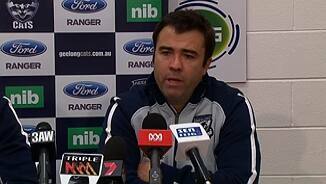 If they are to break this Geelong hoodoo then they have a heap of work to do and it all must start now. A blistering start from the Cats as they register an awesome nine first quarter goals and take a 45point lead in to the first break! Who was expecting this!? BEHIND CATSStephenson drills the pass inside forward 50 and Podsiadly pushes of Gibson to take a great chest grab low to the ground. The J Pod hits the kick to the left. GOAL CATSMackie sets the kick up for Duncan who is 10m in the clear inside forward 50. From 40m, he sets sail and hammers through number nine for the quarter for the Cats! Amazing! GOAL CATSGreat work from Chapman as he pressures Gibson in to a turn over, the ball falls to Johnson and Stevie J unwinds from off one step and drives it home for another! GOAL HAWKSBruest with quick hands out to Lewis who fumbles the ball and then is driven in to the back by Lonergan and the free is awarded. From just 15m out, he drills a much-needed goal! GOAL CATSChristensen running down the flank and he drives the pass deep in to the left pocket to find Chapman again. He takes a step around and bends it through for his third of the quarter! GOAL CATSScarlett receives the handball and spears a low pass to a leading Chapman who marks 40m out from goal. He jogs in and threads the major to give the Cats a 32-point lead! GOAL HAWKSRioli in the middle and the Hawks are out on the fast break. He hits the kick to a two-on-one contest, Lewis taps it on to Bruest who gathers, runs in and rams home the Hawks' first! GOAL CATSDuncan with a clever chip pass inside 50 to find Hunt. Hunt handballs back out to Duncan who fires from long-range and drives home a massive goal! Incredible start! GOAL CATSHunt swings the pass around his body and on to the chest of Chapman. He marks, turns, plays on and drives through the Cats' fourth goal of the night! They are hot, hot, hot! BEHIND CATSChapman snaps the shot around his body from deep in the right forward pocket and in to the base of the post. BEHIND CATSThrough for a behind to the Cats after Johnson hooked it around his body from the boundary - the Cats' first blemish of the night. 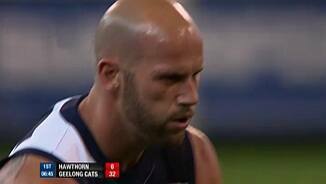 Six of Hawthorn's eight consecutive defeats to Geelong have been by nine points or less, the most recent clash decided by two points in a round two a nailbiter this year, after the Hawks led at 3QT. GOAL CATSBartel works the kick inside 50 right in to the path of Hawkins who takes the grab. From 30m out on a 50 degree angle, he comes in and splits the middle for his 31st goal of the season! GOAL CATSThe ball falls down in front of Christensen out of Podsiadly's hands and he gathers and snaps from the left pocket for a wonderful goal! Great start by Geelong! GOAL CATSJohnson was subbed out of the game last week within the first minute, but tonight he crumbs the loose ball inside attacking 50, breaks away and bends home the opening goal! Geelong holds an eightgame winning streak over Hawthorn in this fierce modern-day rivalry, having not lost to the Brown and Gold since the '08 decider. Is tonight the night for the Hawks? Underway! Welcome to the 'G for this blockbuster clash between the Hawks and Cats. Hawthorn has made a late change: Bailey (illness) is replaced by Savage, who starts as the sub. 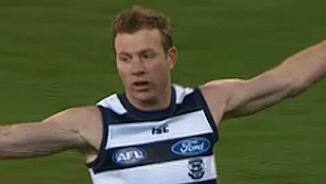 Motlop is the sub for Geelong.